DAYTONA BEACH, Fla., Oct. 15, 2017 – USA won 14 gold medals in rhythmic and acrobatic elite competition on the third and final day of the Pan American Gymnastics Championships at Ocean Center in Daytona Beach, Fla. Evita Griskenas of Orlando Park, Ill./North Shore Rhythmic Gymnastics Center, swept the senior rhythmic individual titles in Daytona Beach, winning the all-around crown and all four apparatus finals. In the senior acro competition, Emily Davis and Aubrey Rosilier, both of San Antonio, Texas/Acrobatic Gymnastics of San Antonio, and Axel Osborne and Tiffani Williams, both of Riverside, Calif./Realis Gymnastics Academy, won the women’s and mixed pair titles, respectively. The U.S. rhythmic gymnasts brought home 19 medals in event finals: gold –Griskenas (senior hoop, ball, clubs and ribbon), Elizabeth Kapitonova of Staten Island, N.Y./Isadora (junior ball, clubs and ribbon), senior group (five hoops), junior group (five ropes and ten clubs); silver – Nastasya Generalova of Los Angeles/California Rhythms (senior clubs), Lennox Hopkins of Puyallup, Wash./Evergreen Rhythmics (junior clubs), Kapitonova (junior hoop), Lili Mizuno of Northbrook, Ill./North Shore Rhythmic Gymnastics Center (senior hoop, ball and ribbon), Shannon Xiao, Fairfax, Va./Gymnastics World (junior ball), senior group (three balls/two ropes); and bronze – Xiao (junior hoop). The U.S. senior rhythmic group, which trains at North Shore Rhythmic Gymnastics Center, includes Dasha Baltovick of Highland Park, Ill.; Natalie Bourand of Burr Ridge, Ill.; Connie Du of Deerfield, Ill.; Yelyzaveta Merenzon of Buffalo Grove, Ill.; Nicole Sladkov of Vernon Hills, Ill.; and Kristina Sobolevskaya of Deerfield, Ill. The members of the U.S. junior rhythmic group are: Celine Cen, Anastasiya Ivanova, Alexandra Militeeva, Samantha Mochel, Venice Park and Ellen Peng, all of San Diego Calif./Emerald City Academy of Rhythmic Gymnastics. The Americans also brought home four gold medals in the elite acrobatic gymnastics event finals: Samantha Conway and Lally Seither, both of New Orleans, La./Crescent City Gymnastics, junior, 27.100 (women’s pair); Angel Felix and Braiden McDougall, both of Riverside, Calif./Realis Gymnastics Academy, junior, 25.640 (men’s pair); Emily Davis and Aubrey Rosilier, both of San Antonio, Texas/Acrobatic Gymnastics of San Antonio, senior, 27.670 (women’s pair); and Axel Osborne and Tiffani Williams, both of Riverside, Calif./Realis Gymnastics Academy, senior, 27.920 (mixed pair). The acrobatic age-group champions in each discipline are: Camila Hernandez and Makena Ludeman, both of San Antonio/Acrobatic Gymnastics of San Antonio, 11-16, women’s pair; Kristian Diana and Maxwell Hendershot of Canada, 11-16, men’s pair; Mila di Salle and Theo Rotts-Chan of Canada, 11-16, mixed pair; Caitlyn Mackrell, Schyler Shults and Satia Wilson, all of San Antonio/Acrobatic Gymnastics of San Antonio, 11-16, women’s group; Reagan Dubbels and Alexandra Edwards, both San Antonio/Acrobatic Gymnastics of San Antonio, 12-18, women’s pair; Carina Newlin and Dorian White, both Castro Valley/West Coast Training Center, 12-18, mixed pair; Alexis Leinonen, Elizabeth Kirchner and Sarah Diamond, all of San Antonio/Acrobatic Gymnastics of San Antonio, 12-18, women’s group; and Sean Butehorn, Daniel Disman, Grant Shields and Sean Shields, all of Columiba, Md./Emilias Acro Gymnastics, 12-18, men’s group. A summary of the medalists is included below. 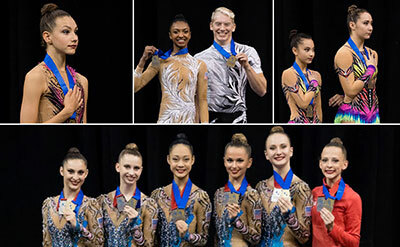 For complete results from the Pan American Gymnastics Championships, please visit usagym.org/17PAGU. Based in Indianapolis, USA Gymnastics is the national governing body for gymnastics in the United States. Its mission is to encourage participation and the pursuit of excellence in the sport. Its disciplines include men’s and women’s artistic gymnastics, rhythmic gymnastics, trampoline and tumbling, acrobatic gymnastics and Gymnastics for All (formerly known as group gymnastics). 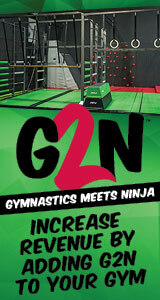 For more complete information, visit www.usagym.org.